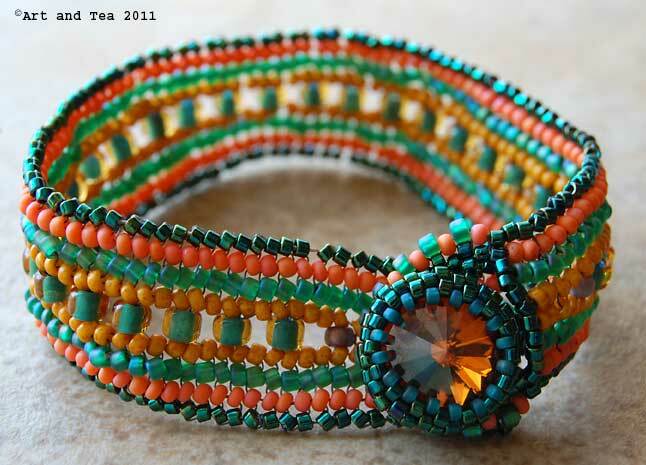 Throughout all of my years of playing with seed beads, one of my most favorite off loom stitches is herringbone weave. Also known as Ndebele stitch, it is the traditional beading stitch of the South African Ndebele tribe. They create the most amazing beadwork in colorful, geometric patterns which they also paint onto their houses. 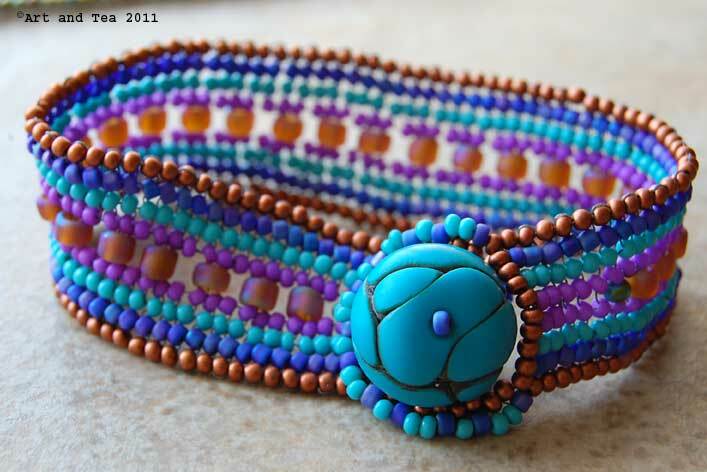 I imagine a beautiful village full of vibrant color and pattern where women sit in a circle and bead together. 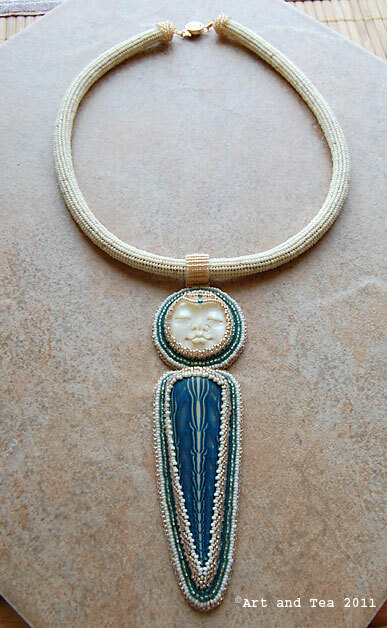 With this stitch, pairs of beads are woven in such a way that they stand in a v-shape next to each other, creating a very strong fabric of beads. 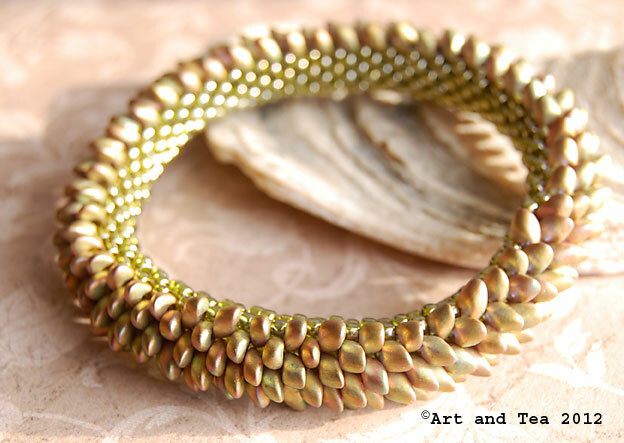 I just love the feel of this bead “fabric”. In my playtime with this weave, I created these bracelets that remind me so much of colorful ribbon. 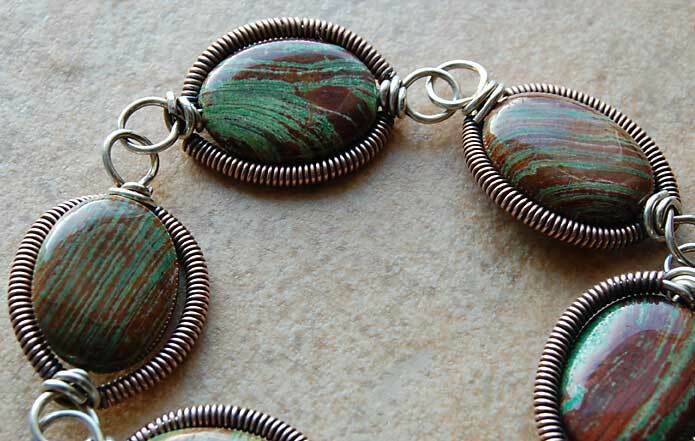 They feel wonderful encircling my wrist and are a great way to showcase a special bead or button as part of the clasp. 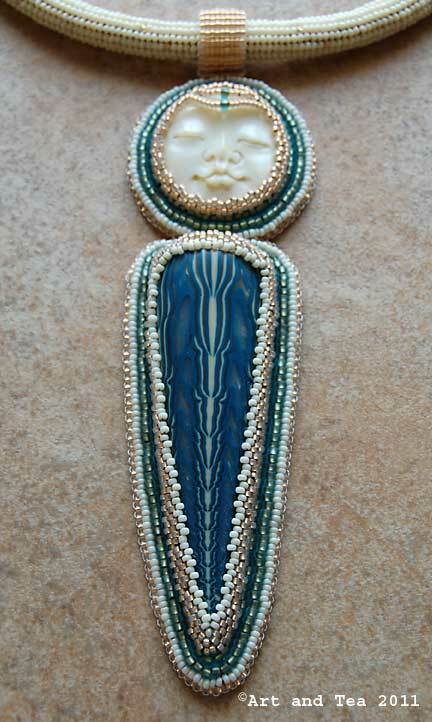 For my bracelets’ clasps (in the order above), I used a beaded Swarovski rivoli, a stamped and gilded polyclay button and my version of polyclay faux turquoise. For my faux turquoise version, I used Tory Hughes’ faux amber technique (from her book “Polymer, The Chameleon Clay“) and just used turquoise-colored clay instead. 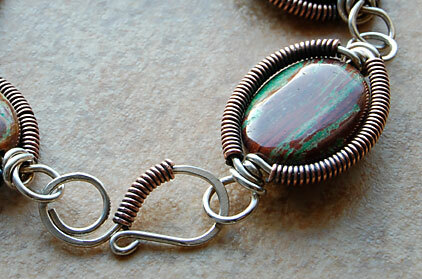 A simple peyote stitch loop completes the clasp. I used size 11 seed beads woven with 6 lb. 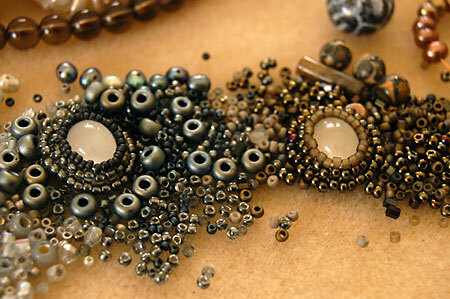 “smoke” Fireline thread and to create interest, I inserted size 6 beads down the middle length. 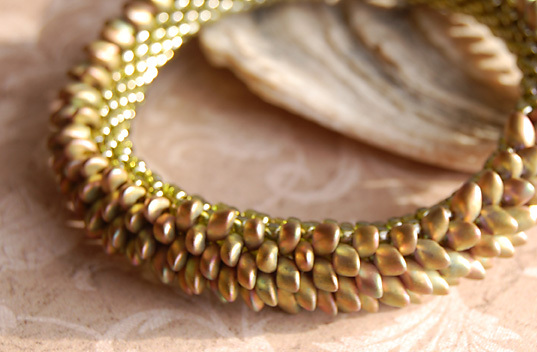 I love the idea of embedding beads with this stitch and would love to explore this idea further by placing the embedded beads in a random pattern. 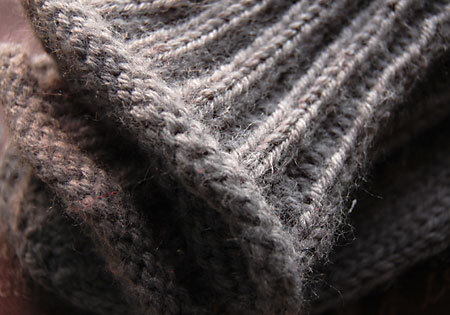 Does anyone know how to do free-form herringbone? That’s another idea I’d like to play with. Tomorrow morning I travel to Michigan to visit my family so there won’t be a Saturday Morning Tea post this weekend. I will rejoin you the following Saturday to share a cup of tea once again. During my time in MI, I’m looking forward to another trip to Beadhaven in Frankenmuth. 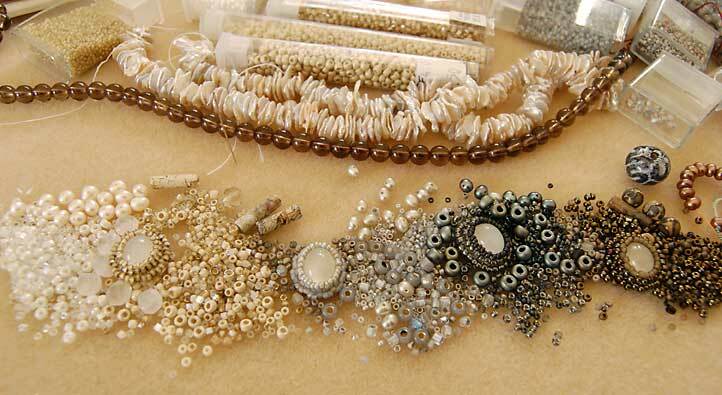 Their seed bead selection is beyond fabulous! Oh joy! Have a wonderful week, dear friends. 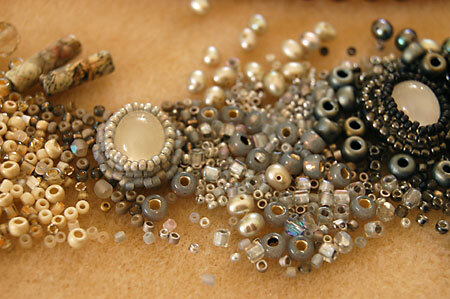 That gently awakening energy has inspired me to create my own beady concoctions here in my studio. 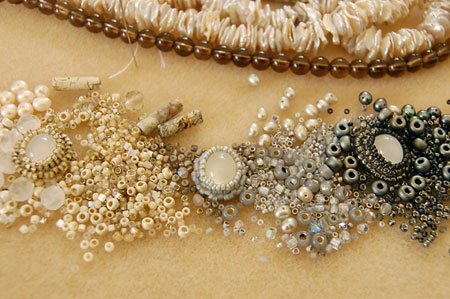 Taking direction on bead color mixing from Beverly Ash Gilbert’s Beaded Colorways book, I’ve experimented with some bead soup of my own in a neutral, winter-inspired palette. I originally wrote about my color inspiration here. 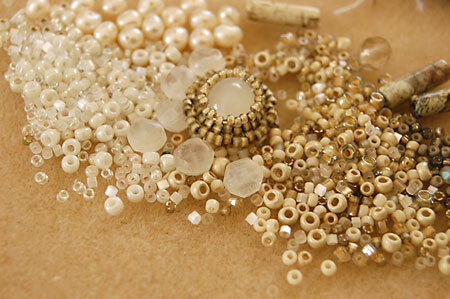 The small moonstone cabochons I found in my stash are encircled with some beads from each soup I mixed. I’ve added some pearls and gemstones in similar hues to round out the soups. 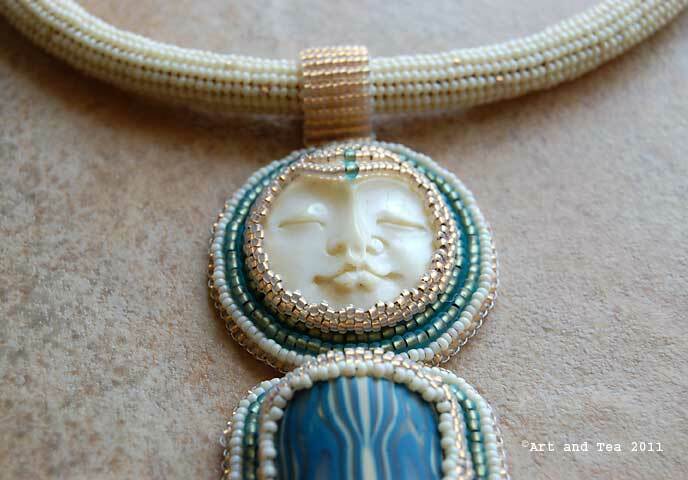 In my continuous quest to find and connect with other artists who drench their lives in color and beads, I have discovered a beady kindred spirit, Beverly Ash Gilbert. 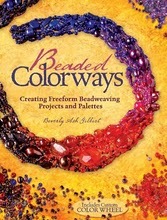 Wandering around the web, I stumbled upon a blurb about the release of Beverly’s new book, Beaded Colorways: Freeform Beadweaving Projects and Palettes. 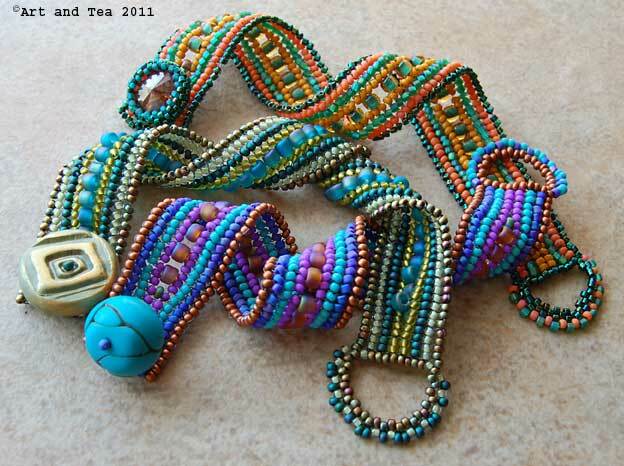 A rich title full of words I love: color, freeform, beads, palettes. After excitedly purchasing her book, I went on an internet journey to find out all I could about this artist who loves color and freeform beadwork as much as I. 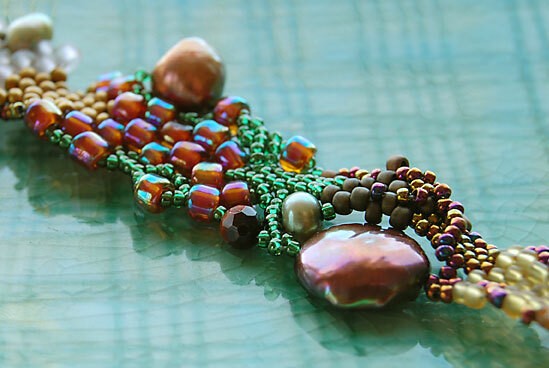 Inspired by the colors of nature in her northwest home, Beverly creates what she calls “bead soups”, mixes of seed beads, gemstones and pearls in variations of a hue. Mmmmmm, just the combination of those 2 words evokes yummy and juicy to me so I know that I’m on the right path, the path of rich becoming. 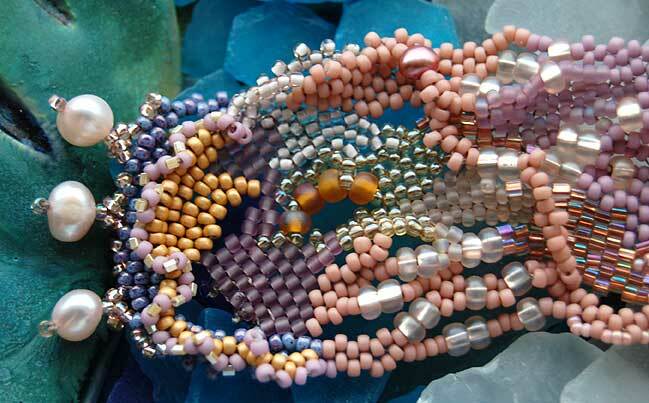 Beverly goes on to create art jewelry pieces using these “bead soups”, transitioning from one “soup” to another in a beautiful flow of color. 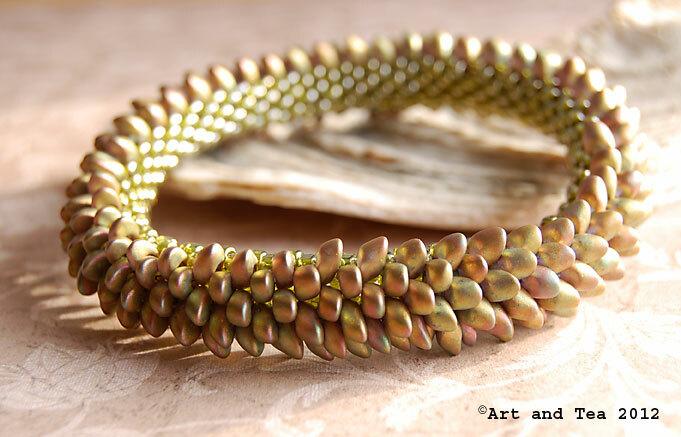 Take a look at the gorgeous pieces in her gallery. In my own freeform approach, I choose a color palette inspired by nature. 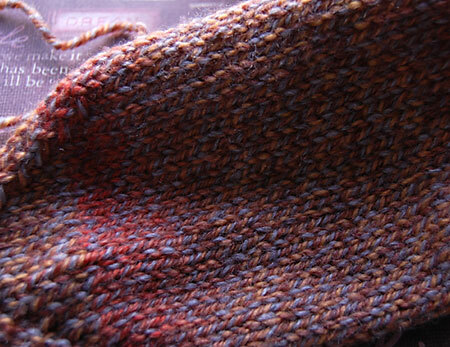 and then create patches of color (from that palette) that weave over and around each other. 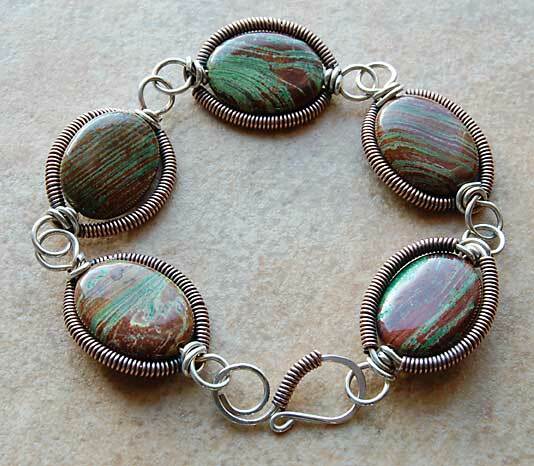 Beverly has inspired me to expand how I look at my color choices and enhance my work with my own “bead soups”. 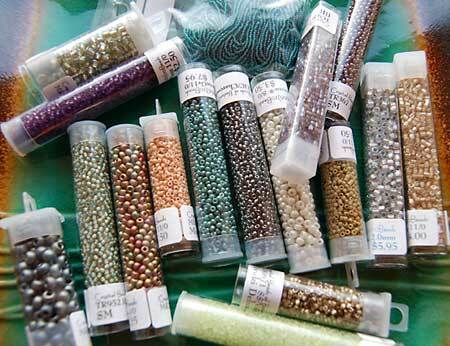 Even though her clear writing and instruction speaks to all levels of beading experience, I find that it is ideal for someone like me who already has a fairly large bead stash for mixing and blending. 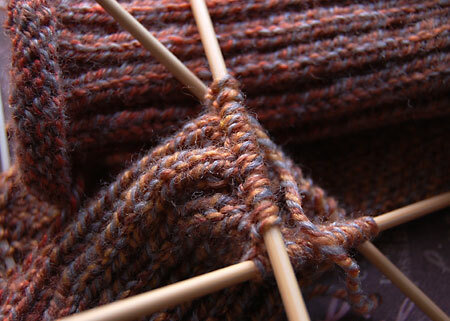 A New England winter palette threads its way through the fiber of my being these days, evidenced by my latest knitting creations. 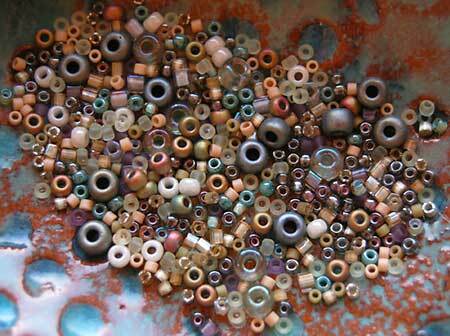 and the beads I chose on my birthday bead store excursion. Hmmmm, yes, winter….but look….peeks of spring here and there. I think it’s time for another freeform bracelet. 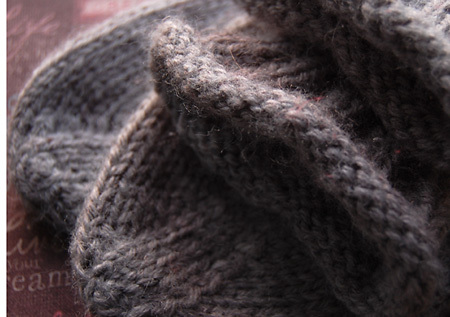 What inspires you at this cold, muted color time of year? My art voice has been very quiet here lately. As I have become increasingly focused on fixing up my new home and moving in, I know that I have been neglecting the playful, art side of myself in a big way. Now, feeling totally overwhelmed, I’m quickly learning how very important it is for me to set time aside and regularly nurture that side of myself to maintain balance in my life. I think that when that feeling of overwhelm creeps into our lives, it is because something important is being neglected. All that said, I embraced my art self once again when I attended Lindly Haunani’s color workshop called Dancing with the Rainbow. With her soft voice and gentle manner, Lindly patiently brought us to a greater understanding of the world of color and, most appealingly to my inner “Color Kitten” (my favorite childhood book by Margaret Wise Brown), how to mix colors (oh joy!) to achieve a color palette that is a true expression of your artistic voice. Our homework before the workshop was to gather pure color images clipped from magazines. As described on pages 44-47 in Lindly’s book (written with Maggie Maggio), Polymer Clay Color Inspirations, our first task was to sort these images into subsets of color families, those colors that “went together”. We then chose the subset that resonated most strongly with our inner spirit. As we went through this process, Lindly spoke with each participant one by one and carefully observed their body language and listened to their voice very closely for clues to individual palette preferences. Once we chose our subset, we created a collage with the images. Out came the scissors and glue sticks and I felt like a little kid again, joyfully arranging my images onto a sheet of Bristol board. Fall was definitely in the air that day as quite a number of us chose a similar autumn color palette. Once our collages were complete, we brought them together and carefully studied each one, choosing the polymer clay primary colors that best represented our collage colors. Zinc or cadmium yellow? Fuschia or cadmium red? Ultramarine or cobalt blue? We used the Premo brand of clay but you can use any brand as long as you have a “cool” and “warm” version of each primary. One of the most amazing teachings of this workshop was about “mud”, the color you get when you mix all 3 primaries together in equal proportions. We all think of mud as being, well, mud brown. Well, the “mud” mixed from my set of primaries was actually dark green. And the neatest part was when we took small pieces of mud and mixed them into our primary and secondary colors to achieve the most gorgeous earthy shades. Wow! With a range of colors mixed from our primaries, we then began to cover a wood framed mirror that Lindly had brought for each person. Just when I got into the groove of covering mine, it was time to go home! Isn’t that always the way of it? Here are some closeups of the beautiful collages and frames started. I passionately encourage you to run, not walk, to your nearest bookstore and pick up a copy of Lindly’s book. If you have the wonderful opportunity to take one of her workshops, even better. It will change the way you view color forever. It has with me and I am looking forward to studying again with this marvelously talented artist. Lindly, you are truly my color hero and I thank you from the bottom of my heart for your inspiration.